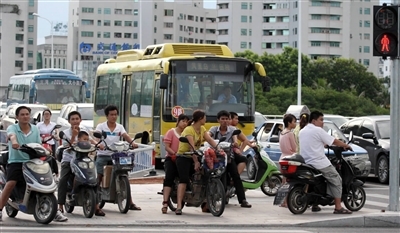 Sanya recently announced a detailed plan to manage the number of e-bikes on the streets as well as limit the number of motorcycles in the city. There are now over 21,000 motorcycles registered in the city, amongst which only 2,800 are up to date with their annual inspections and have all requisite license certificates. 1. The city central Region: the Intersection of Fenghuang Road and Hedong Road(Railway Station Intersection), the Intersection of Fenghuang Road and Jinjiling Road, the Intersection of Hedong Road and Jinjiling Road, the Intersection of Sanya Bay Road and Jinjiling Road(Yinhai Intersection) and the Intersection of Fenghuang Road and Yingbin Road(Police Station Intersection). 3. Sanya Railway Station Region: Yuxin Road, Yuxiu Road and the roads within the Railway Station. 5. The two road sections including the section of from Yingbin Road Intersection to Sanya College Intersection and the section from Yinhai Road Intersection of Sanya Bay Road to Haihong Square.